Go Back to Africa! 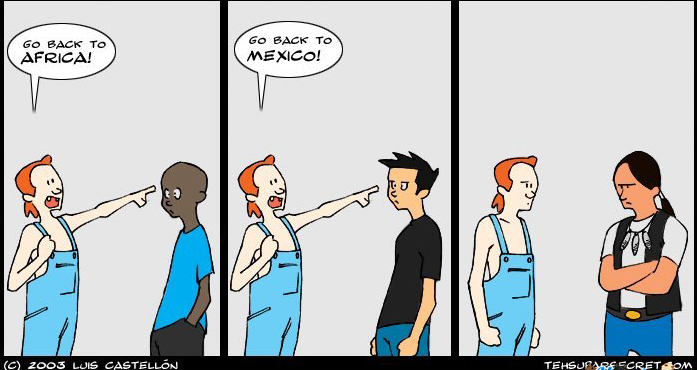 Go Back to Mexico! cartoon, 2003. (Luis Castellón; http://google.com). It is part of the racism, narcissism, and stupidity of many US Whites to respond to protests, die-ins, boycotts, and even the most minor criticisms of systemic racism and oppression with “Go Back to Africa.” Or, “If you don’t love America, then leave,” as if most Blacks have a real choice. The amount of ignorant cruelty in these knee-jerk responses says as much about the individual racism of these supposedly right-standing Americans as it does about their comfortability with systemic racism and the psychological — if not material — benefits these Whites draw from Black suffering. Or, Native American suffering, as has been the case with the response of Whites to the Dakota Access pipeline protests over the past couple of months. Or Latino suffering, with chants of “Build that wall!,” “Send them back!,” and “Kick them out!” by Donald Trump’s exclusively White supporters for more than a year. A few years ago, I had a White student in a World History course who was upset by my lecture about the historical consensus that the American Revolution wasn’t as transformational an event as Americans pretend. The student was so caught up that told me to “Go back to Africa” after the class. The lecture was about the nature of revolutions, and per usual, I compared the American, French, and Haitian Revolutions, and used various measures to compare their impact on the social order, on political systems, and on the social mobility of the citizenry after the fact. And as usual, I showed that there was much more change in France and Haiti (the latter the first successful slave-led revolution in modern history) than there would be in the new US until the Civil War. But I had shattered a student’s worldview of America as always good, and the American Revolution and the US Constitution that followed it as part of some predestined, divinely-inspired, genius-infused plan of greatness. The result was the student yelling at me, “You’re anti-patriotic!,” “You don’t love America!,” and “If you don’t love America, you need to get out!” I mostly ignored the student’s racial Tourette’s, and got to the heart of their issue: a mediocre grade on a paper assignment and their complete misunderstanding of US history in the context of world history. 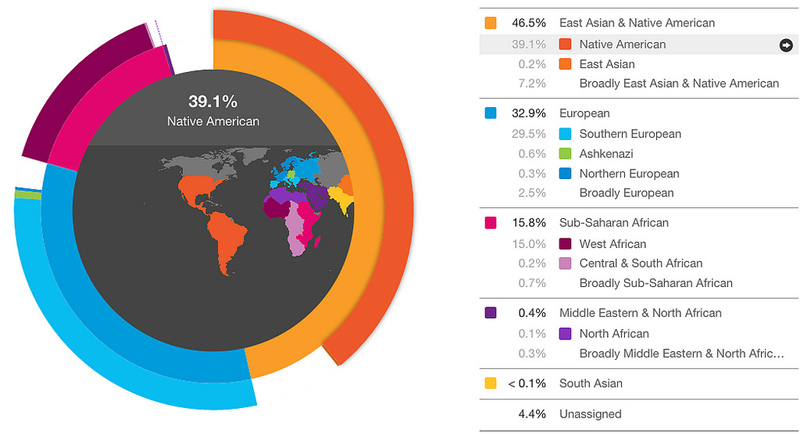 23andMe sample results, November 2, 2016. (http://ForumBiodiversity.com). The student’s issue, though singularly unusual for me in a classroom setting, is something Blacks hear from Whites in everyday settings literally every day. Like selfish, brattish five-year-olds, many Whites claim everything and everyone as their playthings, and if we disagree, we should leave, we should suffer. But “Go back to Africa?” Even without DNA testing, demographers know half of the 44 million Blacks in the US are partly White, and about one in eight are part Native American. In my case, should I go back to Nigeria, Ghana, or the Ivory Coast, and to what group? Igbo, Yoruba, Wolof? Should I drill down, find that I’m at least one-eighth Choctaw, and apply for tribal membership, so I can live on a reservation in Oklahoma? Or should I sue the estates of the Scotch-Irish assholes who came to the US between 1795 and 1818 for owning my ancestors, for their crimes against humanity and for reparations, and then move to Edinburgh or Dublin? No, I don’t have to leave at all. As James Baldwin said, “I insist on the right to criticize” the US “perpetually”. But if the White folk who firmly believe Blacks, Latinos, and even Native Americans ought to leave, maybe they should buy a one-way ticket to someplace that will make them feel even more at home than Europe. For these “Leave America [insert racial epithet]” people, they should seriously consider Australia. Seriously. Australia is perhaps the closest America’s Whites-first people can get to a “White man’s country” or a White person’s utopia they can find. Sure, there’s also Europe, but European immigration policies would likely lead to a high-rejection rate, due to lack of skills, higher education, and no need for political asylum. 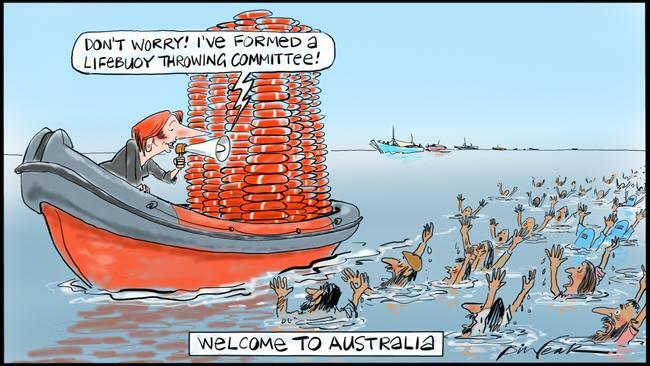 Then Australian Prime Minister Julia Gillard not welcoming migrants and asylum seekers cartoon, June 30, 2012. (Bill Leak, http://www.theaustralian.com.au/). In Australia, the image of the rugged White individual remains in full bloom. Their immigration policies are very much the ones Trump’s almost exclusively White supporters would go for. In Australia’s case, anyone without a passport or a visa coming to their shores by boat finds themselves in detention centers in the remote Southwest Pacific island nation Nauru or on Los Negros Island in Manus Province, off Papua New Guinea. For those with visas who’ve committed minor crimes like a traffic violation, those visas can be revoked automatically, and those people can be sent to deportation centers on Christmas Island (off the southwest coast of Indonesia, but an Australian territory), or in remote parts of Australia (less likely). Everyone from asylum seekers from Iran, Iraq, and Syria to Britons and New Zealanders arrested for misdemeanors have all been caught up in Australia’s Migration Act, its Pacific Solution, and its post-Pacific Solution solution. Now this is a country for American White folk who want a country mostly in line with their values. You just have to leave for Australia. One caveat, though. In 1996, Australia passed the National Firearms Agreement, which restricted ownership of semi-automatic and automatic weapons. But that shouldn’t matter. Whiteness should trump all for Whites who would take up my offer to leave for Australia, a continent and country of 24 million, a place that is 92 percent White.